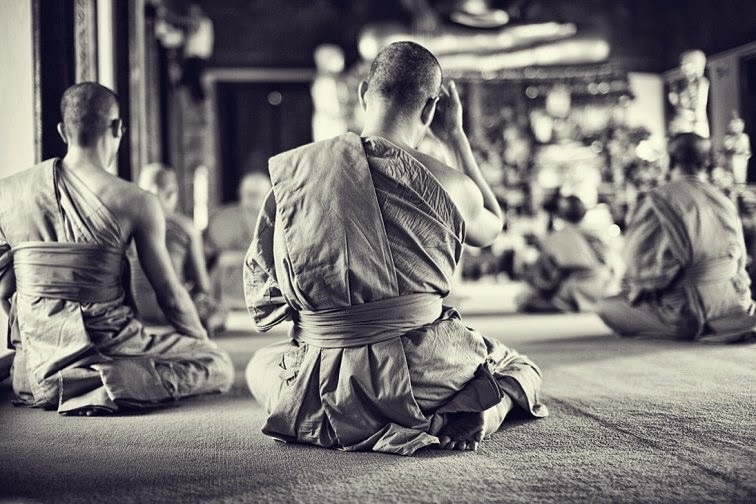 The sangha is a principle which much of the world can greatly benefit from. People come together in groups all the time, but it’s usually for the purpose of creating monetary riches or obtaining substantial power and rarely towards the united goal o1f attaining peace, happiness, and realizing greater wisdom. Buddhists understand that you can hardly help another before you help yourself. But this isn’t referring to you gaining power or riches before you can help others, or living in a way that you ignore others. This is mostly referring to the fact that because we’re all interconnected, by you helping yourself you create an exponentially positive effect on the rest of the world. If you want to make an impact on the world, don’t falsely convince yourself that it’s “you or them”. You don’t need to drag yourself through the mud to help those around you. If you do this, you’ll greatly hamper your ability to create a positive impact. At the deepest level of understanding, by making it about you you’re also making it about them because you know there’s no separating “you” and “them”. Take care of yourself and seek to be more than just a help, but an example of how to live for others to follow and you’llcreate waves of exponential possibility that inspires others to do the same. Death is an often taboo topic in Western society. We do everything we can to not only avoid the subject, but pretend that it doesn’t even exist. The reality is, this is really unfortunate and in no way helps us lead better lives. Becoming keenly aware of your ownimpermanence and deeply understanding the nature of death with regards to our interconnectedness are both things which can help us find great peace. In Buddhism, students in many sects at one point or another “meditate on the corpse” as it were (a practice which is said to have originated at least as far back as the Buddha’s lifetime). This is literally what it sounds like. They meditate on the image of a corpse slowing decomposing and imagine that process through to its end, eventually resulting in a deep and profound realization on the true nature of death. That might sound a little intense to you, but the truth is, if you live you’re entire life acting as if you’re never going to die or ignoring your own impermanence then you won’t ever be able to find true peace within yourself. You don’t necessarily have to meditate on the image of a corpse, but simply opening up to yourself about death so that you’re no longer shielding it from your mind (which you’re likely doing unconsciously, as that’s how most of us were brought up in the West) can begin to be a great source of peace and help you appreciate the many joys in your everyday life. By contemplating on the food in front of us, for example, we can come to realize the vast system of interconnectedness that is our life, and how our food coming to be on our dinner plate as it is depended on numerous elements coming to be. Giving is more than the act of giving Christmas and Birthday gifts, it’s also about those gifts which we give each and every day which we don’t typically see as gifts at all. Buddhists hold a very deep understanding of the nature of giving, particularly in that life is a constant play between the act of giving and receiving. This doesn’t just help us find peace in understanding the way of the world around us, but helps us realize the amazing gifts we all have within us that we can give others in every moment, such as our love, compassion, and presence. The easiest way to sum up all “spiritual” practice is this: spirituality is the act of coming in touch with the ultimate reality or the ground of being, and as a result spiritual practice is the act of overcoming those obstacles which keep us from realizing that. To put it short and sweet, the reason the ego is the major obstacle in spiritual practice, or simply the practice of finding true peace and happiness (whatever you choose to call it, it’s all the same), is because it’s very function is to pull you away from the ground of your being by convincing you that you’re this separate self. The process of unraveling the ego can take time, as it’s something which has been with us, intertwined with us, for years. But it’s infinitely rewarding and altogether necessary if we want to realize our best life. Together, these 3 poisons are responsible for the majority of the pain and suffering we experience as a collective species. It’s perfectly normal to be affected by each of these poisons throughout your life, so don’t knock yourself for falling for them. Instead, simply accept that they’re something you’re experiencing and begin working to remove them from your life. This can take time, but it’s a key aspect on the path towards realizing true peace and happiness. We should all strive to work and make our living in a way that’s more “conscious” or aware. This generally means not selling harmful items such as guns, drugs, and services that harm other people, but it goes deeper than that. There’s ultimately two aspects to this: making a living by doing something which doesn’t inhibit your own ability to realize peace and making a living doing something which doesn’t inhibit others ability to realize peace. Facing this can lead to some interesting situations for some people, and as Thich Nhat Hanh has mentioned this is a collective effort as opposed to a solely personal one (the butcher isn’t a butcher only because he decided to be, but because there is a demand from people for meat to be neatly packaged and made available for them to be purchased from supermarkets), but you should strive to do your best. Following the teaching on right livelihood can help you realize the harmful effect that your own work is having on you and therefore coming up with a solution can result in a largely positive shift in your life as a whole. Only you can decide if a change needs to happen though. To realize non-attachment in a Buddhist sense doesn’t mean to abandon your friends and family and live alone for the rest of your life, never truly living again just so that you don’t become attached to these desires. Non-attachment refers to living in a way that you exist in the natural flow of life and generally living a typical modern life, building a family, working, etc., while simultaneously not being attached to any of these things. It simply means to live in a way that you’ve become aware of and accepted the impermanence of all things in this life and live in a way that you’re ever-aware of this fact. It’s perfectly normal for a Zen student in Japan, once having completed his training, to actually de-robe and go “back into the world” so to speak. This is because, once they’ve reached this level of realization, they see the beauty in all things and are compelled to live fully absorbed in all the beauty and wonders of this life. From this point on, they can truly “live life to the fullest”, while not clinging to any of these things. Keep in mind, this doesn’t mean that you stop feeling emotions. On the contrary, these emotions are welcomed and expected, and fully experienced with mindfulness in the moment of their impact. But this is simply the natural course of things. Once these emotions subside though, and when we have no mental formations or obstructions to block our path, a natural healing process takes place that heals the wound and allows us to continue on living in peace and joy instead of dragging us down into darkness.